Originally posted in the Microsoft 365 blog. In the modern workplace, rising expectations to innovate and improve productivity are putting pressure on employees to do more in less time. The world’s most successful organizations are addressing this by adopting new ways of working that leverage Microsoft 365 with OneDrive for Business and SharePoint to manage and collaborate on content. Today, we are announcing upcoming capabilities that, along with our recent investments, combine the power of artificial intelligence (AI) and machine learning with content stored in OneDrive for Business and SharePoint to help you be more productive, make more informed decisions, and keep more secure. A key to being productive is leveraging existing content so you’re not reinventing the wheel. Historically this has been challenging due to the exponential growth of digital content, particularly with image, video, and audio files. Until now, these rich file types have been cumbersome to manage and painful to sift through to find what you need, when you need it. 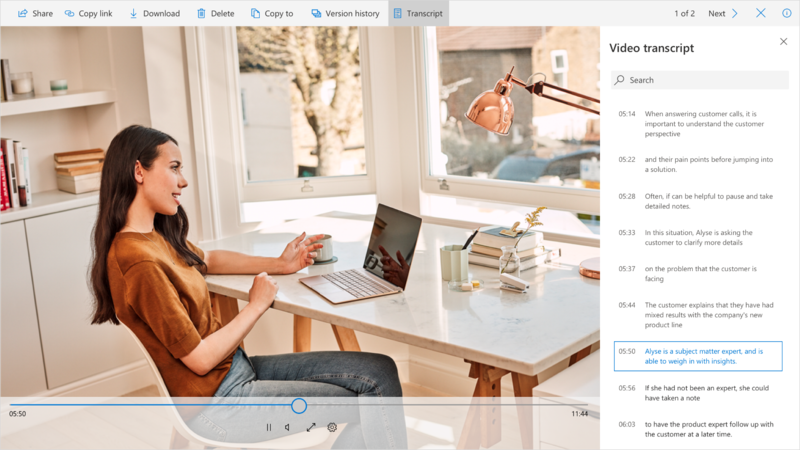 Video and audio transcription—Beginning later this year, automated transcription services will be natively available for video and audio files in OneDrive and SharePoint using the same AI technology available in Microsoft Stream. While viewing a video or listening to an audio file, a full transcript (improving both accessibility and search) will show directly in our industry-leading viewer, which supports over 320 different file types. This will help you utilize your personal video and audio assets, as well as collaborate with others to produce your best work. Once you’re ready to make a video broadly available across the organization, you can upload and publish to Microsoft Stream. You’ll continue to get transcription services plus other AI driven capabilities, including in-video face detection and automatic captions. Importantly, your audio and video content never leaves the Microsoft Cloud; it is not passed through potentially costly and insecure third-party services. Searching audio, video, and images—Announced last September, we are unlocking the value of photos and images stored in OneDrive and SharePoint. Using native, secure AI, we determine where photos were taken, recognize objects, and extract text in photos. This recognition and text extraction allows you to search for images as easily as you search for documents. For example, you could search a folder of scanned receipts for the receipt that mentions “sushi.” Video and audio files also become fully searchable thanks to the transcription services described earlier. Intelligent files recommendations—Later this year, we’ll introduce a new files view to OneDrive and the Office.com home page to recommend relevant files to you. Suggested files are based on the intelligence of the Microsoft Graph and its understanding of how you work, who you work with, and activity on content shared with you across Microsoft 365. 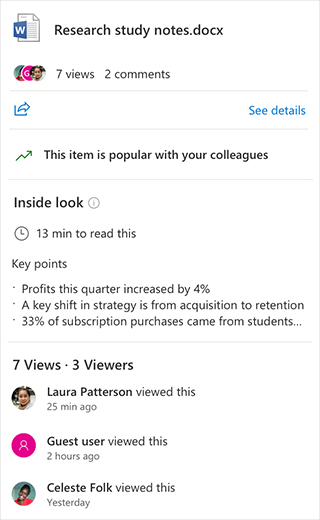 This deep understanding of user behavior and relationships among coworkers is unique to Microsoft 365 and continues to be enriched as you collaborate on content in OneDrive and SharePoint. AI also makes it easier to create new documents by reusing existing content. The Tap feature in Word 2016 and Outlook 2016intelligently recommends content stored in OneDrive and SharePoint by understanding the context of what you are working on. This allows you to leverage and repurpose a paragraph, table, graphic, chart, or more from another file while working on a new document or email. OneDrive and SharePoint make your life easier thanks to innovative AI that helps you make more informed decisions while working with content. File insights—Earlier this year, we rolled out an updated file card, providing access statistics for any file stored in OneDrive and SharePoint. This allows you to see who has looked at the file and what they have been doing, and it helps you decide your next action. Later this year, we’ll bring these valuable file statistics directly into the native Office application experience. Additionally, we’ll introduce additional insights to the file card with “Inside look,” giving you important information at a glance—including time to read and key points from the document, so you can choose to dive in deeper or save it for later. Intelligent sharing—Later this year, you’ll have the option to easily share relevant content with meeting attendees. For instance, if you just presented a PowerPoint presentation, you’ll be prompted to share it with the other attendees once the meeting is over. 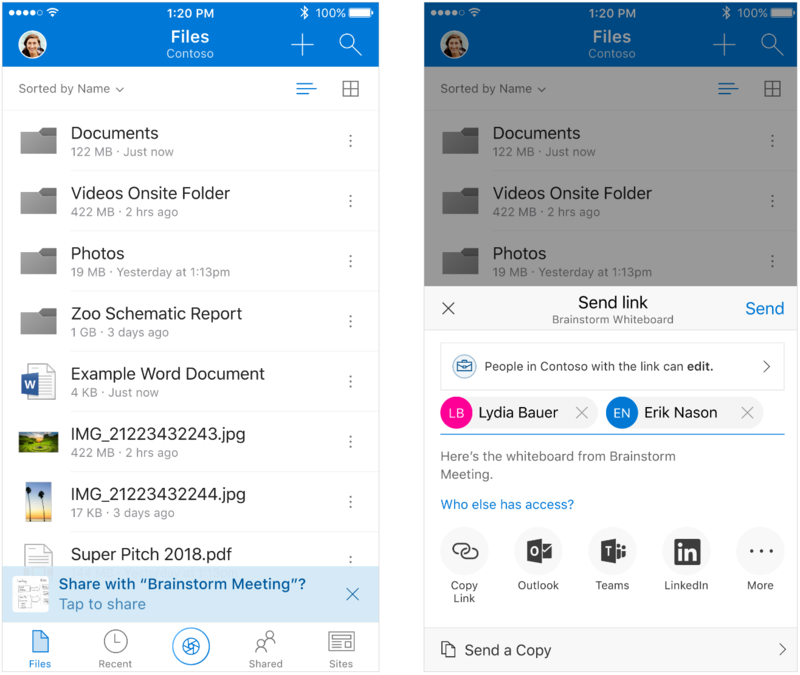 In the OneDrive mobile app, we’ll automatically prompt you to share photos taken during the same meeting, perhaps of a whiteboard where you brainstormed new ideas with your colleagues—all based on your Outlook calendar. 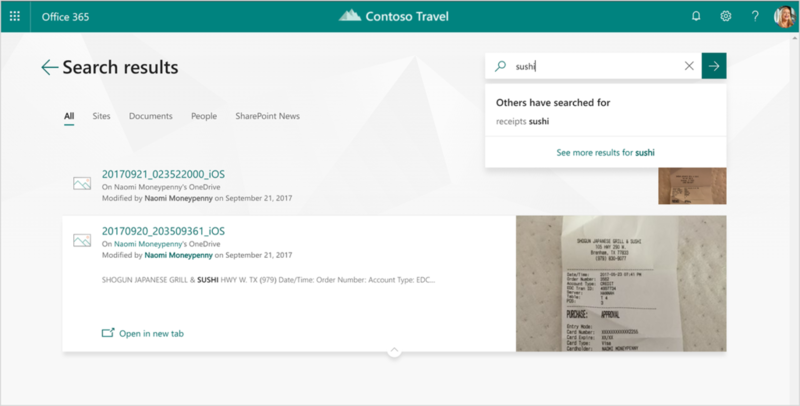 This type of real-world intelligence allows you to quickly keep everyone informed and move on to your next task and is exclusively available when you store your content in OneDrive and SharePoint. 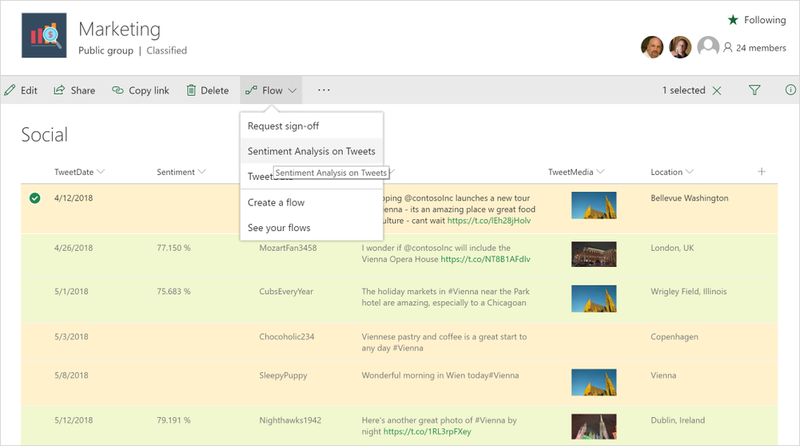 Data insights—Earlier this year at the SharePoint Virtual Summit, we showed you how you could immediately enrich your OneDrive and SharePoint content with intelligence by leveraging the flexibility of Microsoft Flow and the power of Azure Cognitive Services. Since these services are powered by Microsoft Azure, you can get sentiment analysis, key word extraction, and even custom image recognition—all while keeping your content secure in the Microsoft Cloud and away from potentially costly and insecure third-party services. 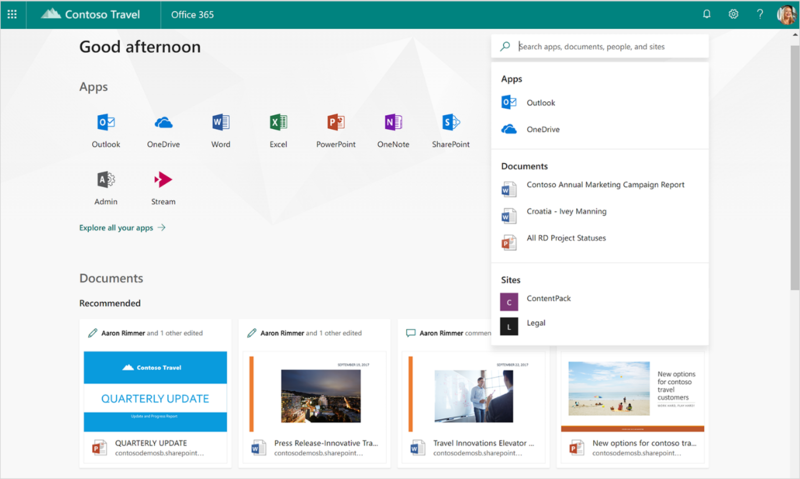 Additionally, you can use information provided by these cognitive services to set up custom workflows to organize images, trigger notifications, or invoke more extensive business processes directly in OneDrive and SharePoint with deep integration to Microsoft Flow. When your files are stored in OneDrive and SharePoint, AI also helps to protect your content, keep you compliant, and thwart malicious attacks. OneDrive files restore—Earlier this year, we released OneDrive files restore including integration with Windows Defender Antivirus for business and personal users to protect you from ransomware attacks by identifying breaches and guiding you through remediation and file recovery. With a full 30 days of file history and sophisticated machine learning to help us spot potential attacks early, OneDrive gives you peace of mind for every file you store. Best of all, moving your files to OneDrive has never been easier thanks to Known Folder Move. Intelligent compliance—In addition to being able to apply native data loss prevention (DLP) policies and conduct native eDiscovery searches on textual content stored in OneDrive and SharePoint, with the innovations discussed above, we’re making it even easier to use these key compliance capabilities with audio, video, and images later this year. Soon you’ll be able to leverage the text extracted from photos and audio/video transcriptions to automatically apply these policies and protect this content. As you can see, by leveraging Microsoft’s industry-leading investments in AI we have made OneDrive and SharePoint in Microsoft 365the smartest place to store your content. In fact, Microsoft is recognized as a leader by Gartner in both their Content Collaboration Platforms Magic Quadrant and Content Services Platforms Magic Quadrant reports, as well as Forrester in both their cloud and hybrid Forrester Wave™: Enterprise File Sync and Share Platforms Q4 2017 reports. You can start realizing these benefits and more by moving your content to OneDrive and SharePoint today, just as Fortune 500 customers MGM Resorts International, Walmart, Johnson Controls International, and Textron are doing. You’ll automatically get more value as we continue to invest in these and other new AI capabilities to help you achieve more. Microsoft has a bold vision to transform content collaboration for the modern workplace inclusive of files, dynamic web sites and portals, streaming video, AI, and mixed reality, while reducing costs and improving compliance and security. Be sure to join us at Microsoft Ignite from September 24–28, 2018 in Orlando, Florida, or on-demand, where we’ll continue to unveil how AI will accelerate content collaboration in the modern workplace.